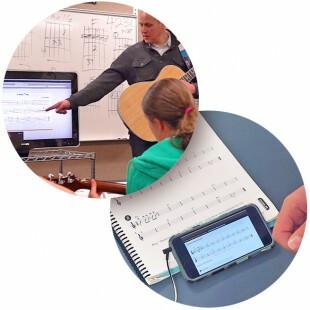 This fun and engaging 46 lesson, blended learning classroom guitar course is a paced to be taught over two semesters. The curriculum is standards based and also includes lessons on core creative skills including composing chord progressions and beginning improvisation. Like all Consonus courses there’s a focus on ensemble playing with 18 guitar ensemble arrangements that are perfect for concert performance. 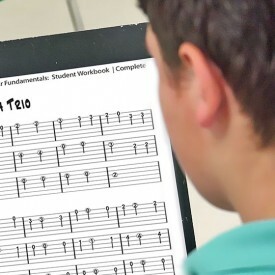 Ensembles include audio backing tracks and bass accompaniment parts in tablature for live performance. There are numerous solo pieces and lead sheets as well. All repertoire integrates with the curriculum and emphasizes the diverse capabilities of the guitar as an accompaniment, solo, and ensemble instrument. Styles include folk, country, blues, rock, latin, swing, and classical. The Beginning Guitar Complete course has 18 guitar ensembles in a variety of styles. Every ensemble has a playalong track for the entire ensemble or with one of every part removed so students can practice along at home or in the classroom. 01. First Time Around Register for a Free Trial to hear this track. 03. A Minor Thing Register for a Free Trial to hear this track. 05. 6 Spanish Strings Register for a Free Trial to hear this track. 07. Moonset Register for a Free Trial to hear this track. 09. Puerto Escondido Register for a Free Trial to hear this track. 11. Hang Loose Register for a Free Trial to hear this track. 13. Up All Night Register for a Free Trial to hear this track. 15. Greensleeves 2 Register for a Free Trial to hear this track. 17. Groovin’ Register for a Free Trial to hear this track.